Whatever Happened to the Rock and Roll Stars Puppies? Where are the Rock and Roll Stars puppies now? Jagger, Hendrix, Dylan, Grace and Zappa are almost 14 weeks old, and they're happily learning everything they can about the world with their puppy raisers. On Wednesday, they had their last early socialization puppy class. When puppies first join their puppy raisers, they attend early socialization classes with their littermates. These classes are as much for the puppy raisers as they are for the dogs. Puppy raisers have the opportunity to ask questions and learn tips and tricks for training the dogs. In this last class, we practiced loose leash walking, where the dog walks calmly next to its handler without pulling. The leash must be nice and loose. Loose leash walking involves a lot of self control, which is one of the most important things a puppy raiser can teach the dogs-in-training. Why is self control so important? Imagine a balance dog assisting his partner to walk through a parking lot. The partner is holding on to the leash and the balance harness that the dog is wearing. Suddenly, the dog smells something wonderful in the grass three feet away. He dashes over and plasters his nose to the spot. His partner is yanked sideways and falls to the pavement. At the very least, she is bruised and may have difficulty getting back up, especially because she now needs to convince her dog to abandon the interesting smell and return to her side. She could also have a broken bone, or worse. A dog with self control would have ignored the wonderful smell in the grass. He would continue to walk calmly beside his partner, assisting her safely across the parking lot. Self control extends to more areas than just loose leash walking. Dogs must have self control around food, at doors (waiting calmly and not dashing through), around other people and animals, etc. In this last early socialization class, however, we focused on just loose leash walking. First, we had each puppy demonstrate loose leash walking with their puppy raiser. The pups all did very well! In this video, SSD Grace walks next to her puppy raiser on a nice, loose leash. Notice how she focuses on her puppy raiser. At one point, she turns and looks at one of her littermates, but instead of lunging toward him, she demonstrates wonderful self control and looks back at her puppy raiser. Here, SSD Jagger walks on a loose leash. Look at that attention! He doesn't take his eyes off his puppy raiser. While one puppy was demonstrating loose leash walking, the other puppies had the opportunity to practice down-stays, meaning they relax in a down. 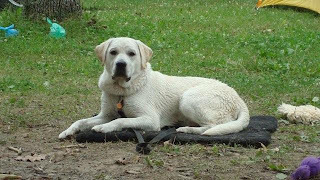 SSD Dylan gives a nice down-stay while he waits his turn to demonstrate his loose leash walking skills. To keep him focused and to reward him for such good attention, his puppy raiser gives him treats. After each puppy demonstrated loose lease walking, we had the puppy raisers exchange puppies. Now the puppies had to do loose leash walking with an unfamiliar person! The reason we had them swap puppies is because the pups will eventually have someone else training them. When they go to advanced training, they'll have a new trainer, and eventually, they'll be paired with a partner when they become service dogs - all different handlers who will have slightly different ways of asking the puppies to do the same thing. The puppies need to be able to adapt to different handlers. The Rock and Roll puppies did a great job! In this video, SSD Zappa walks nicely on a loose leash. His attention is on his handler, even though she's not his usual puppy raiser. Notice how Zappa gets a little excited near the end of their loop around the room and jumps on his handler. She does a great job resetting him. She simple backs up until Zappa is back in position for loose leash walking, and then they move forward again. After they've taken a few steps, she clicks and treats. We call this the "penalty yards" method of training loose leash walking. As soon as the dog starts to pull, or in this case, jump, the handler backs up until the dog returns to its place at the handler's side. Once they've taken a few forward steps on a loose leash, the dogs gets clicked and treated. SSD Hendrix settles right in with his new handler. He walks on a loose leash right past his brothers and sister and completely ignores them. The next time the puppies come to puppy class, they'll be joining the rest of the dogs in training. We're sure that both puppies and their puppy raisers will be well prepared to join the regular classes. Send them some good wishes in the comments! The Gemstones Puppies Go Shopping! Aqua, Amber, Coral, Diamond, Topaz, Taz and Opal didn't really go shopping. But they did go to the mall! Today the puppies went on one of their first public outings to the Colonial Park Mall. Our trainers, the puppies' breeder caretakers and several of our wonderful volunteers each took a puppy and walked around the mall. Even though the puppies are only seven weeks old, it's important for them to have early socialization with new people and to visit many new environments. Sometimes new people and environments can be very scary for dogs, so we make sure that the puppies have plenty of new experiences so they learn to adapt quickly and easily. Once they become service dogs, they'll find themselves accompanying their partner to all sorts of different places, and they need to be able to continue to assist their partner no matter what situation they're in. The Gemstones puppies seemed to have a blast in the mall. The puppies probably greeted every person who was in the mall today - great experience for the pups! Normally, you shouldn't just stop and pet a working service dog or service dog-in-training, especially without asking first. However, for this particular outing, we wanted people to pet the puppies. We invited everyone to stop and pet them. In addition to greeting people, the puppies encountered stairs, ramps, and loud noises. 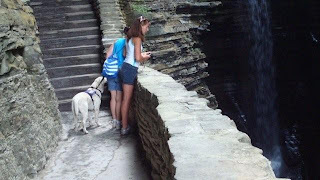 In this video, SSD Amber (red collar) walks up the steps. SSD Taz and his handler found a photo booth at the mall, and Taz had no trouble walking through it to reach his handler on the other side. SSD Diamond checks out the kid cars. SSD Aqua walks on a loose leash. SSD Opal has a great time exploring the mall. Check out her smile! SSD Topaz takes a quick look around. After taking care of an itchy spot, SSD Coral heads over to greet more people. The Gemstones puppies met their dad, SSD Fire! Before the puppies were allowed in the main yard with Fire, they played in their own small fenced in area. Once the puppies were settled outside, we took one puppy - Topaz - into the main yard to meet Fire. Fire sniffed at him, but didn't really seem all that concerned or interested in him, and we brought the rest of the pups in. Soon the puppies were running and playing with each other. Although Fire didn't really seem interested in playing with the puppies, SSD Cabo, the other dog that the puppies' breeder caretaker is raising, loved to play with them. When he lays down, all the puppies gather around him, sometimes snuggling with him, sometimes playing, and sometimes even play-biting his tail. Cabo never loses patience with them, and if they sometimes bite his big fluffy tail too hard, he gently lets them know. Coral, Opal, A!qua, Topaz, Taz, Amber and Diamond certainly enjoyed their playtime outside! For a dog that loves to swim and go hiking, a week of camping is a dream vacation. Nubble went on his first camping trip to Seneca Lake at Sampson State Park in the Finger Lakes Region of New York last week and loved every minute of it! Before Donna and her family left for their camping trip, she was a little concerned about how Nubble would handle it. He loves to play with other dogs and gets very distracted by them, and she knew that there would be lots of dogs at the campground. But even though Nubble tried to pull Donna toward every dog the first night, he realized that dogs were just another fact of life and calmed down. He may be starting to realize that every dog is not a playmate. He still barked once at the dogs walking by, but other than that, he made great progress. Sometimes it's tough to sleep in a strange place, but Nubble had no problem. Donna put his crate under the overhang of their tent, and he settled down nicely. The first night he was a little concerned because everyone stayed up late and was making noise, but with all the swimming, walking and other excitement during the day, Nubble was ready to sleep at night. 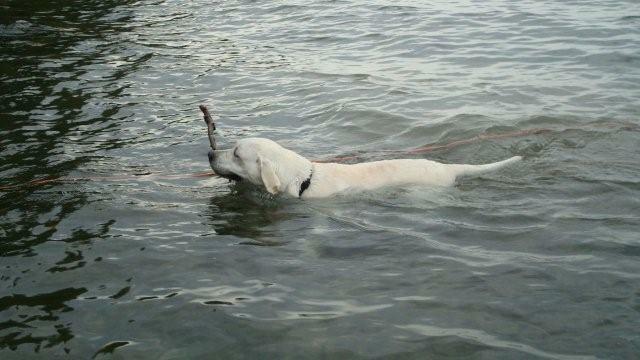 Just because Nubble was on vacation doesn't mean he had a break from his training. In fact, vacations like this are the perfect time to practice because there are so many new distractions. Nubble went on lots of walks with his puppy raisers, and there were plenty of opportunities to practice leave it - other dogs, butterflies, kids on bikes, frisbees... When Nubble saw a group of people playing frisbee, he really wanted to join them. He soon figured out that leave it also applies to human toys, even if they look suspiciously like dog toys. If you've been following our posts about Nubble, you probably know that stairs are a huge challenge for him. Well, at the campground, he got lots of practice. There was a long flight of steps leading down to the swimming area and playground, and Donna and Lindsey walked him up and down many times to get him comfortable with stairs. 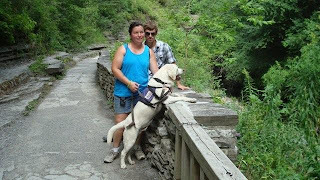 Donna wanted to walk the gorge at Watkins Glen, and there are over 800 steps going up! She wanted to make sure Nubble would be able to do it. And he did! Their trip to Watkins Glen was a success! All those stairs had him pretty excited, though. He would look at the next flight as if he wanted to bolt right to the top. He managed to contain himself, though. By the end, he was so tired that he wasn't even thinking about rushing up the steps! They took the path for most of the way down rather than the stairs, but when they did take the stairs, Nubble walked nicely next to Donna. Watkins Glen has a waterfall, and Donna wasn't sure how Nubble would react. He loves water, and she was afraid he would try to jump in! He seemed to understand that the waterfall wasn't something he could play in. The next day they went to Taughannock Falls. This trip, however, was a different story. Because this was a challenging outing for Nubble, Donna packed plenty of power treats to keep him focused on her. Well, Nubble got into the treat bag and ate all of the power treats before they even got to the Falls! All Donna had left was kibble - not tasty enough to make Nubble ignore all of the wonderful sights and smells, and definitely not tasty enough to compete with the lure of the water next to the path. They did find a can of Kong treats, though, which helped a little bit. But Nubble just kept pulling and pulling. Finally, Donna gave him to Lindsey for a while. She used the Kong treats and took him down near the water. As soon as Nubble was walking by the water, he was a completely different dog, walking nicely beside Lindsey. Nubble loved swimming at the campground. The lake was very calm the first two days, but then the water got choppy. At first, Nubble just watched the waves, not exactly sure if he wanted to have anything to do with them. But of course, he was soon diving into the waves and jumping over them! By the end of the week, Nubble was exhausted! The car ride from New York was the longest drive he had done since he traveled all the way from Maine when he was eight weeks old. (Nubble originally came from Maine. He's named after the Nubble Lighthouse there.) He had done great on the ride to New York, with lots of water and breaks. On the ride home, he was even better. He slept the entire way! Back home, it was time for a vet visit for his nine-month x-rays. When the dogs are nine months old, they get x-rayed to make sure that their bone structure is good enough for them to continue in our service dog program. If a dog has problems with their bones, such as hips or elbows, we will not place them with a person. It wouldn't be best for the person or the dog. This vet visit was well-timed, because Nubble had picked up a hotspot on his neck and the vet was able to treat it when he came in for his x-rays. And when the vet weighed him, he weighed 66 pounds! Quite a big boy! This weekend, Nubble is off to Ocean City, MD! We'll have more about his beach trip next week. Thank you to everyone who came to our National Assistance Dog Week meetup at Doc's Saloon and Grill last night! We had a great time! Twenty-two people and nine dogs met for food and fun. 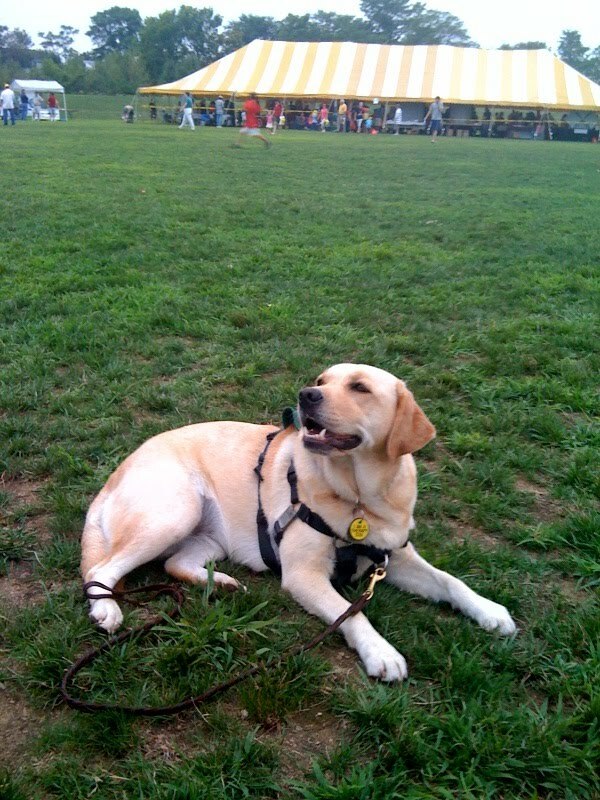 As National Assistance Dog Week draws to a close, we would like to share one more story with you. This is the story of SSD Patsy and her partner. Patsy is a real life best friend. My son Bryce has a form of Autism called Asperger's Syndrome. Three years ago we got Patsy from SSD, and she changed not only Bryce's life but all of ours. Bryce never had any friends (due to the nature of this disorder, socialization is a major problem.) Another big problem was Bryce never slept in his bed. He needed someone close to him to rub his hair to fall asleep. We tried dolls, stuffed animals, music, a lot of covers on his bed etc. When Susquehanna Service Dogs asked us what Bryce's needs were, we told them: mostly sleeping and companionship, and throwing and catching a ball would be a plus, too. Well, Patsy not only answered all of those request in the first day but has also helped Bryce make friends. Patsy will never know how much she changed our lives. Bryce sleeps all night with Patsy sleeping on him and he rubs her fur. She leans on him when he is having a meltdown and plays ball in the yard when nobody will play with him. We take Patsy everywhere we can and she is such a good conversation starter which has helped Bryce in the socialization area. We love her so much and we do not know how we ever lived without her. Patsy is our ANGEL, a prayer answered, a best friend! We Love You Patsy Girl!!! Even more than celebrating service dogs, we're celebrating the way they change lives. We would like to share the story of SSD Jack and his partner with you. This is not the most endearing story or a story of miraculous rescue. It is not funny or dramatic, and it is not short. But it is the story of a service dog that permanently changed my life over the months and years of our relationship and is still changing it today. I hope that someone will read it and gain new knowledge and understanding of the gift of hope that all service dogs give to their disabled partners. My name is Sharon and I suffer from a psychiatric disability. About six years ago I was spending a lot of time in the hospital due to the severity of my symptoms. Then a friend called me and told me about a show she'd seen on dogs that help persons with psychiatric disabilities. She told me that I needed a dog to help me since I was too hard headed to accept help from my friends. I thought, "Oh, funny, ha ha," and it seemed like a pretty silly idea to me. Then darned if I didn't see a different show covering the same topic within the week. I was hooked and began investigating immediately. 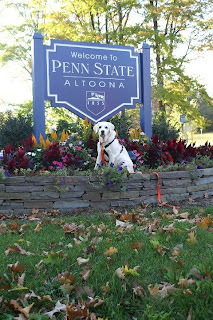 Not many service dog programs train dogs for this type of work but, fortunately for me, Susquehanna Service Dogs (SSD) was within an hour of my home and was willing to either provide a service dog for me or help me train a service dog for myself. I wanted to adopt a "rescued" dog and do the training myself so I began checking the local shelters. I looked for weeks but was not having any luck. I was visiting a Humane Society shelter once again but didn't meet a dog that might be the "right" one. I decided to go back into the kennel area one more time to visit with a dog that I had considered. To my surprise, there was a beautiful puppy in the first kennel inside the door that I had not yet met. I immediately asked to take him into the visitation room and knew within minutes that I had found *my* dog. He was curious but not destructive, lively but not hyperactive, and very friendly but not passive so I knew he would grow up to be a wonderful dog. He also just seemed so happy to meet me! I believe my urge to go back into the kennel one more time and find this dog came from a higher power. I took him home the same day! I want to make it very clear to anyone who may consider training their own service dog that this is not a process to be undertaken lightly. I reached an understanding with SSD that if the dog I adopted did not successfully complete the training program, and almost half of even those dogs specially selected for service dog training do not, I would keep it as an emotional support animal or companion. Making arrangements, in advance, for re-homing would also have been an option but I knew I would keep this dog forever. Happily, after over a year of attending SSD puppy class twice a week and receiving private lessons from SSD trainers, my wonderful dog Jack and I completed our certification class and graduated as a working service dog team. 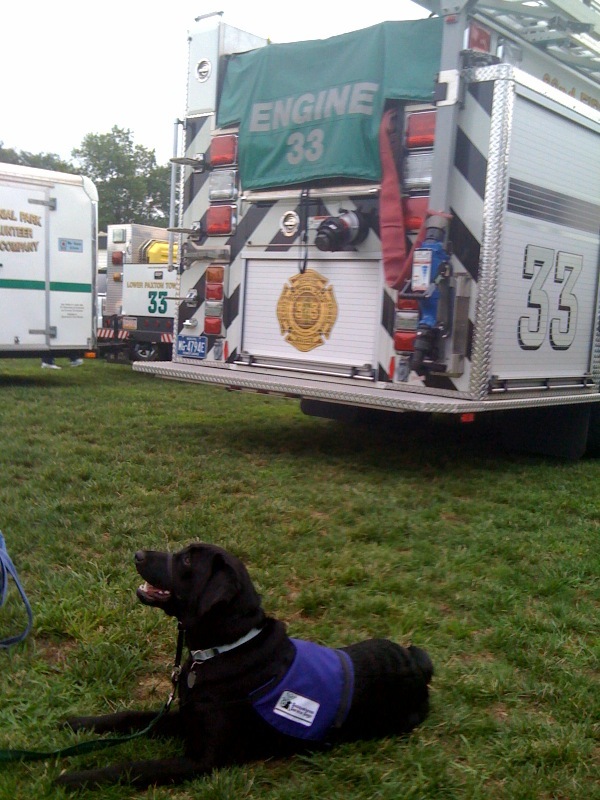 My service dog, now "SSD Jack," began accompanying me 24/7 wearing his new green vest. Now here is the crux of this story. During training it became apparent that Jack did not like it when my level of functioning was impaired. I expected a dog that would "comfort" me when I was depressed and "protect" me when I was anxious. Jack is trained to pay attention to me at all times and in response to certain symptoms perform one of the tasks he is trained to do, either in response to my body language or on cue. He did his job well but it was apparent that he also became concerned and appeared somewhat upset. Every time I became anxious he seemed worried too. It was obvious that he could detect subtle changes in my mood and behavior but instead of wanting to "help" me he seemed to want to steer clear of me. I felt like I wasn't taking care of him well enough and I wondered if I had picked the "wrong" dog after all. To my surprise, I soon realized that my service dog was actually increasing my ability to monitor myself and quickly manage negative symptoms. I am able to observe Jack's reactions to what I say and do and to recognize much earlier than I ever had before when I need to change my environment, allow him to calm or support me as he is trained to do, or take prescribed medication that Jack carries for me. I was soon able to leave my house with confidence that I would not "break down" in public and am now able to independently care for myself and my service dog. Jack is now almost five years old and we are a great team. Nowadays Jack rarely needs to remind me that he is my first concern. If I become too distracted, anxious or disorganized he stops cold and waits for me to "get it together." He now appears confident that I will get organized and take care of both him and myself and I almost always do! These days I am rarely hospitalized and am able to participate in many activities that had been unavailable to me before I had Jack as my partner. Having an "invisible" disability is often not easy. People wonder why someone who "looks" fine would need a service dog and I am occasionally treated rudely. However, I don't need anyone else to tell me how my life has changed since I found SSD Jack. Because I have a service dog with me I am confident and able. In fact I often look fine because I am fine as long as Jack is with me! 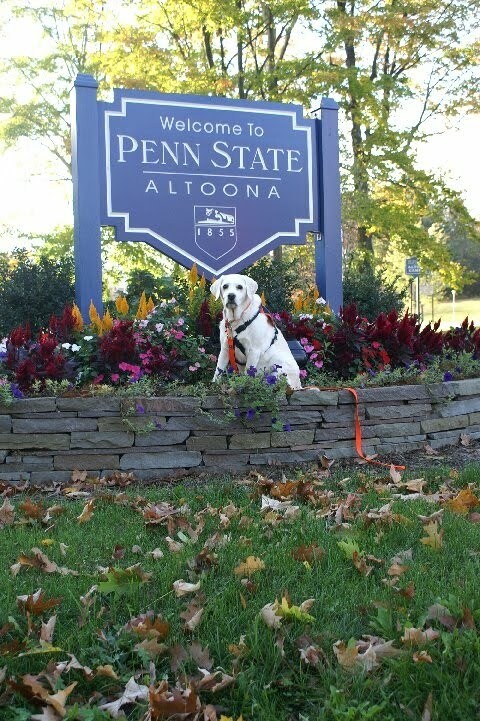 I will be forever grateful to Susquehanna Service Dogs for helping me train this wonderful dog but most of all I am grateful to my service dog, Jack, for enabling me to live a normal life. In honor of National Assistance Dog Week, we're going to share stories about services dogs and the love and support they give to their partners. This is the story of SSD Sara and her partner. I am writing this in memory of my hearing dog, Sara, from Susquehanna Service Dogs. 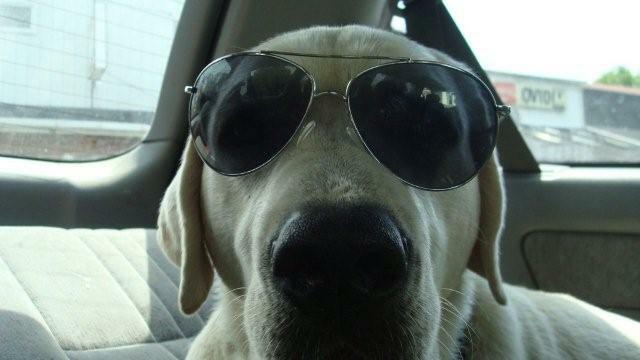 Sara was an extremely bright and beautiful yellow lab that touched so many people's lives, especially my own. She would alert me to the simplest of things such as people walking and talking behind me, the phone ringing, someone knocking at the door, or a flock of geese flying overhead. I would watch her body language very intently because I knew her every movement was her way of alerting me to my surroundings. She taught me how to trust and believe in her and her training, and most importantly that she would forever be "my ears." My work involves traveling and I often find myself staying overnight at a hotel. Making reservations includes ensuring the room is accessible to my deafness. Often times when I carefully and dutifully make the necessary arrangements for my hotel room, I soon discover the accommodations to be insufficient and not meeting my needs. Sara became a part of my life in 1998 when I heard that Susquehanna Service Dogs was training dogs as hearing dogs. I knew I couldn't pass up the opportunity and promptly sent in my application. Sara and I were destined to be together. We made a formidable team. She knew my needs before I knew them. She would work for me 24/7, 365 days a year with complete dedication. An example of this dedication occurred when Sara and I had our first overnight trip together. I was in Philadelphia for a meeting and then had a long drive to Pittsburgh before our day ended. We arrived at the hotel tired and decided to go to bed early. Within 30 minutes after retiring to bed, Sara was alerting me with her nose and kept going to the door. As part of her training, I was taught that when Sara acted that way I was to follow her. So, I followed her to the door and looked out the "peep" hole. I couldn't see anyone or anything outside. I went back to bed, but she continued to alert me to the door. After numerous alerts, I decided to open the door to show her nothing was going on. To my surprise there were four firemen, the hotel manager and a sign language interpreter. They came to inform me that we had to leave quickly because there had been a bomb threat. The entire time Sara was alerting me she was doing her job. From that moment forward I knew I could always count on her and trust her to meet my needs. She was my guardian angel that evening. Christmas was a very special time of the year for Sara and I. Together we discovered how truly loved and cherished we both were. Many of our friends, neighbors and co-workers would give Sara toys or treats as part of their giving spirit during the holiday season. Sara's dedication and love towards others and myself never faltered. We would go into the community to nursing homes, colleges and schools to talk with people (particularly children) to educate them about service dogs and hearing dogs. Sara's loving nature made all this possible. Then one fateful day I was told the devastating news that my precious Sara had cancer in her shoulder. I spent the next few weeks giving her as much love as she had given me. I wanted her to know how much I loved and appreciated her so we spent time doing her favorite things such as smelling flowers and swimming. 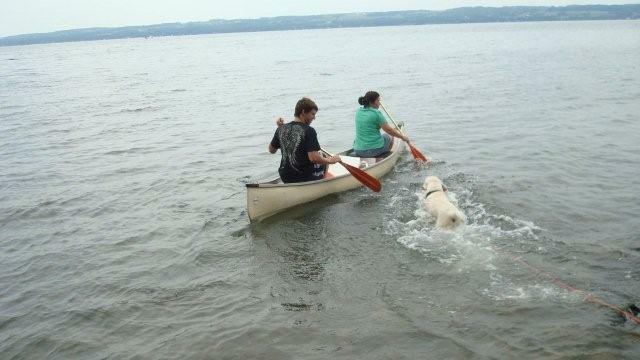 One of our favorite pastimes was going to the lake. Sara loved the water. She would race ahead of me. I would throw an empty water bottle into the lake and she would retrieve it. Sara's zest for life was contagious and with her by my side, I couldn't wait to see what each new day would bring with Sara as "my ears." Saying goodbye to Sara was the hardest thing I ever had to do. She will be forever in my heart. She taught me how to trust, how to love, and that I didn't need my hears to hear, I only needed to listen with my heart. 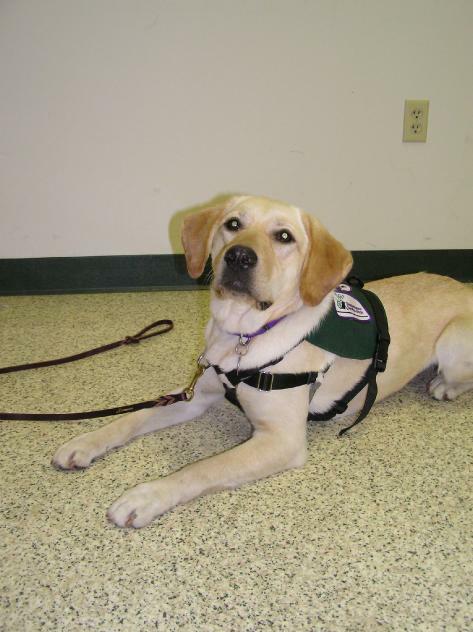 I dedicate this story in memory of my precious Sara, and I thank Susquehanna Service Dogs for training her and giving me such a special gift. I wouldn't be the woman I am today with out either of them coming into my life. In honor of National Assistance Dog Week, we're going to share stories about services dogs and the love and support they give to their partners. 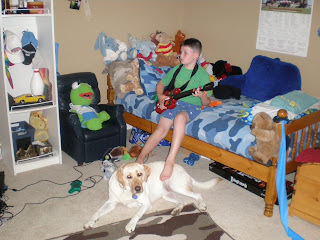 This is the story of Nathan and his service dog, SSD Sylvia. 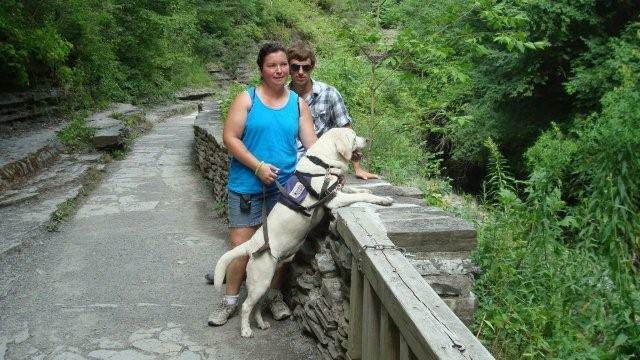 Nathan and Sylvia- a Susquehanna Service Dog - have been partners now for almost 7 months. We take them to big crowded stores and malls so regularly now that we sometimes forget what our lives were like just one year ago. The sensory sensitivity that is part of Nathan’s Asperger’s Syndrome made excursions into crowded places intolerable to the point that we simply stopped doing it. We still don’t entirely understand how and why Sylvia’s presence relieves Nathan’s anxiety and sensitivity, but it works so well that we hardly give a second thought to outings now. For years Nathan’s grandmother wanted to send us to Disney World. Shortly after Nathan and Sylvia passed their public access test, we finally made that trip. Nathan’s birthday is July 5th, and there we were on July 4th in one of the most crowded places on Earth. After a thoroughly enjoyable day of rides, many of which Sylvia was allowed to ride too, we watched the 4th of July fireworks from a spaceship ride high over the park. Afterward we made our way back to our cabin though crowds and on various means of public transportation. Midnight struck while we were on a boat on the lake headed back to the campground, and the captain of the boat announced that Nathan had just turned 12. As the passengers on the boat cheered and sang for Nathan, we knew that the joy in his face would not have been possible that day without the help from his loving partner Sylvia. 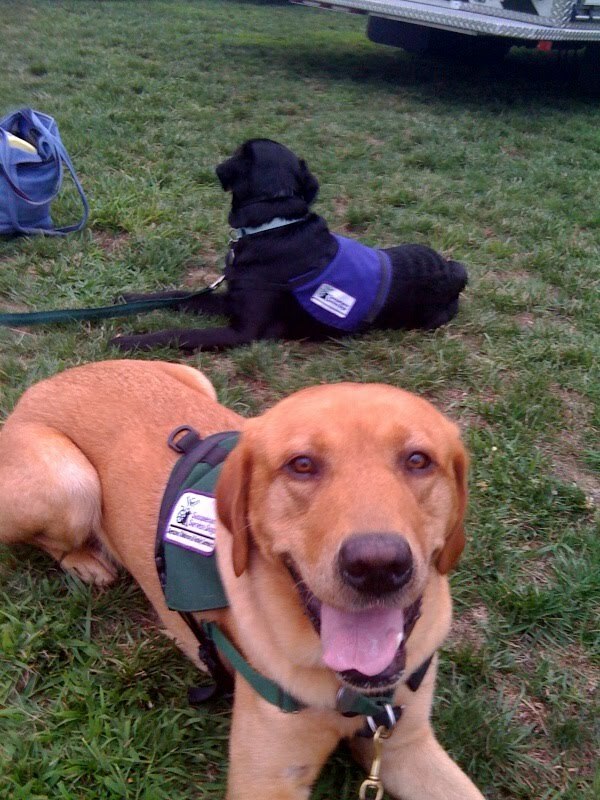 Celebrate National Assistance Dog Week! A mother and her son walk around a crowded mall with a service dog at their side. They stop to look through some tshirts, when suddenly the child, who has autism, wanders off. 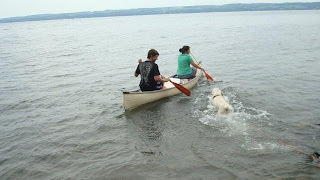 The child's mother immediately tells the service dog to find her son, and the dog is off, following the child's trail with the mother close behind. As the scent grows stronger, the dog moves faster and in less than 5 minutes the dog has located the child. Assistance dogs can do amazing things, and they never stop working for their partners. Today is the beginning of National Assistance Dog Week, and we would like to celebrate all of the wonderful ways that service dogs change lives. 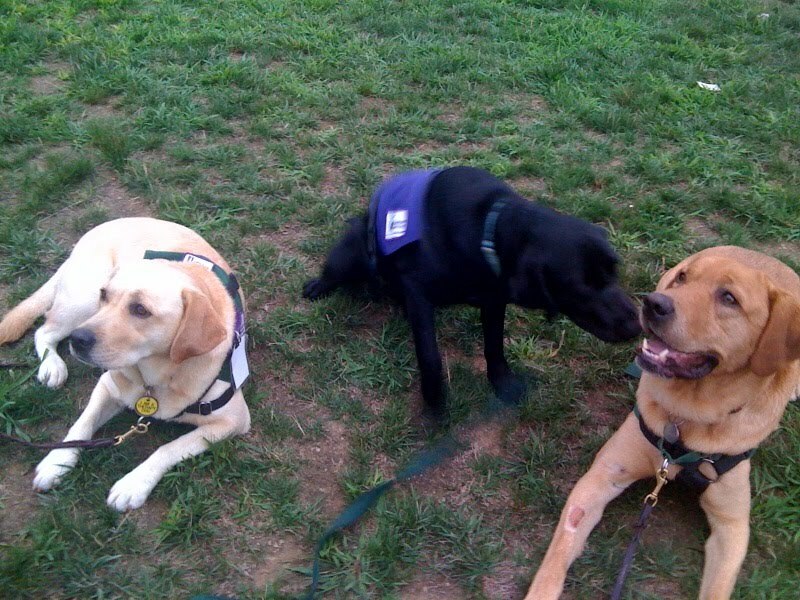 All week, we'll be posting stories about some of our service dogs and their partners. Then on Thursday, we're all going to meet at Doc Holliday's in New Cumberland, PA to celebrate all of the things service dogs do. 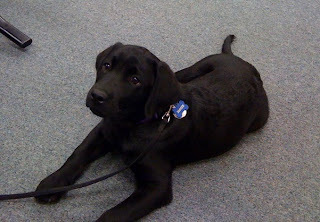 Service dogs and service dogs-in-training are welcome to come! We'll be on the deck at Doc's. Unfortunately, we won't be able to pay for your meal, but we can guarantee that you'll have a great time seeing old friends and making new ones, and of course, meeting the dogs! We're looking forward to seeing you and celebrating all the ways service dogs change lives! The group of dogs that went to the Dillsburg National Night Out gave a lot of puppy kisses that evening! 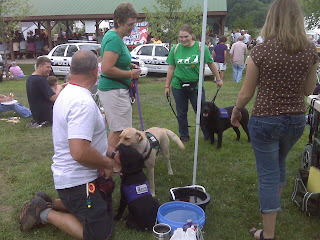 Our puppy raisers shared their experiences at the Dillsburg National Night Out, and we want to share them with you. Our puppy raisers set up a tent with our SSD banner at the Dillsburg National Night Out at Logan Park, and all of our dogs congregated around it. 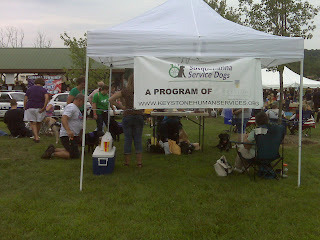 Seven dogs attended, and they had a great time meeting and greeting everyone. It was a great training opportunity for the dogs. They got to practice good behavior around the sirens from the fire trucks and other loud noises. In addition to fire trucks, the Dillsburg National Night Out included helicopters! The dogs got to watch the helicopters take off and land, and some of them even got a tour! There were hamburgers and hotdogs - even ice cream! National Night Out is an annual event, and we hope to see you next year! Who went to a National Night Out in their area? Many of our volunteers and puppy raisers took their dogs to one of their local National Night Out events. They had a blast! National Night Out is a crime and drug prevention event sponsored by the National Association of Town Watch. It's designed to raise awareness about crime and drug prevention and strengthen community spirit. Communities across the nation held National Night Out events. There are fun things for the entire family to do! SSD Rio, Rossi, Star and Fire went to National Night Out at George Park in Harrisburg, PA. They walked around the many fire trucks and police vehicles with their handlers and enjoyed the music. Star met a police horse, and Fire watched people go up in a hot air balloon. Later, Rossi, Rio and Fire relaxed in the grass behind the fire trucks. They loved meeting all of the kids and families who stopped to visit and pet them! It was great way for the dogs to practice greetings, and get used to being around lots of people. Other puppy raisers and volunteers attended National Night Out events in their areas. SSD Phillip and Grace went to the Liverpool event, and SSD Scarlett, Midge, Peach Pie, Wrigley, Sonora and Jagger attended the event in Dillsburg. Did you attend a National Night Out event? Tell us about it in the comments, especially if you met one of our service dogs-in-training!